Santofriends: Whatever you love is endless! Whatever you love is endless! 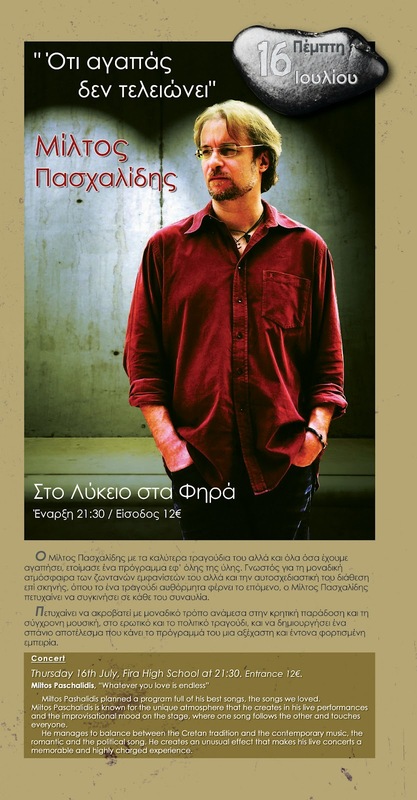 This is the title of the concert of Miltos Paschalides that has been organized for all of us from the Cretan Association of Santorini “ARKADI” within this year’s cultural events. The performer balances in a unique way between the Cretan tradition and the modern – contemporary Greek music, between love songs and political ones. Known for the special atmosphere of his live concerts and his improvisations on the stage, today he has prepared a program full of his best songs. He promises to all of us a night filled with emotions since “whatever you love is endless”. At Fira High School, at 21:30. Entrance 12€.